Keycord was driven by my desire to create a better, more seamless 2FA system for web platforms to use. Keycord is able to distinguish attackers from users by comparing minute differences in typing patterns recognized in keyboard use. Keycord's demo backend was built in Node.js with my own HTTP server library, Vaxic. The server-side processing system was built with Node.js and the demo frontend was built with standard modern web technologies. The frontend recording library was built with JS. Perfecting the detection algorithm wasn't simple and took much trial and error. This system recognizes users with a staggering degree of accuracy, and was built in under 8 hours! I learned about 2FA and how keyboard-based authentication functions. Hopefully I can launch this into its own developer-facing product. I'm hoping to launch a service which makes it easy for developers to record and compare users' keyboard biometrics through an API. 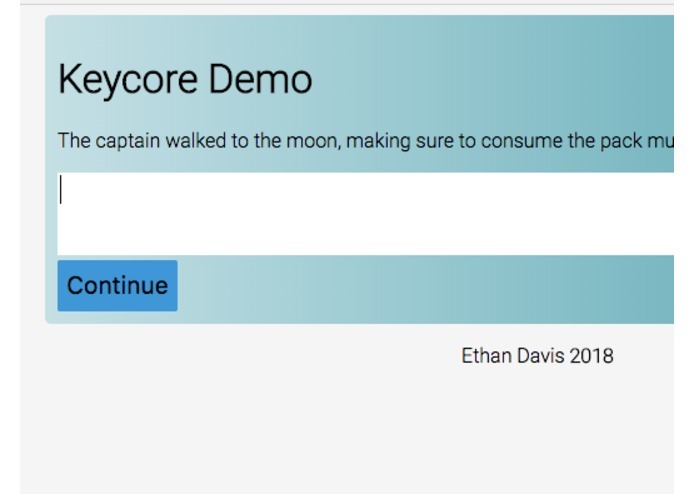 I built all of Keycore, from the demo frontend and server to the serverside processing package and recorder module. Hi, I'm Ethan! I develop things in Node.js and web technologies.